The World Firefly Day was first announced during the International Firefly Symposium in 2017 in Taipeh, by the Fireflyers International Network (https://fireflyersinternational.net/). This is a public awareness event and a conservation action day for the iconic insect around the world. All the countries with fireflies will celebrated during the first week of July every year. 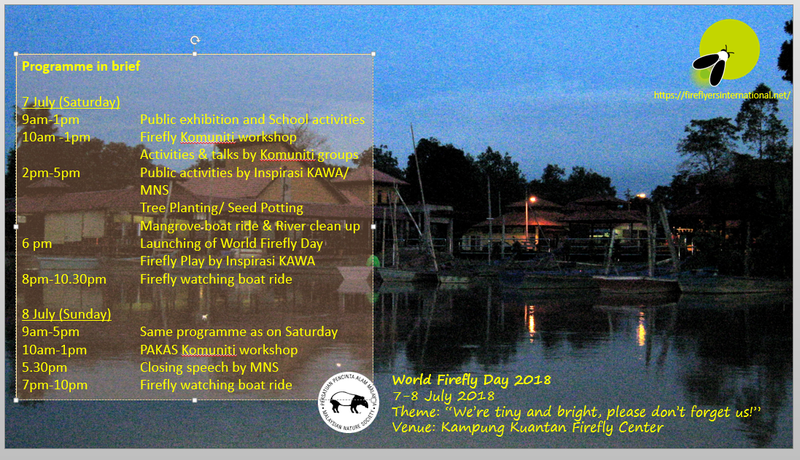 MNS would like to invite you to join us celebrate the World Firefly Day n Kampung Kuantan, Malaysia’s first community run firefly watching center since the 1970s.